Today we’re excited to share a free crochet tutorial which we’re sure you will totally love! This video tutorial is brought to us by Yarnspirations, and features crochet expert Mikey from The Crochet Crowd, who demonstrates to how to create the Tasseled Throw blanket. You can download the free crochet pattern for this project here. 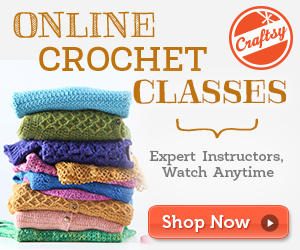 We love showcasing our favourite free tutorials here, to help you refine and expand your crochet skills. What better way to improve your skills than to watch an expert in action?! The softly ribbed Tasseled Throw blanket is made complete with big, luxurious tassels, crocheted in Caron One Pound yarn. Fold this rich blanket over a chunky chair or sofa, to really make a statement. Caron One Pound yarn gives you a rainbow of colours to choose from, so you can achieve a stunning look in all sorts of spaces throughout the home. Consider this project as a unique gift for that someone who has it all! This free video tutorial is brought to us by Yarnspirations.com, where you can find a variety for free crochet patterns, as well as crochet yarn, accessories, tools, kits and much more.